The protector lock was designed by Alfred Charles Hobbs - a locksmith who made his career picking the locks of his competitors and encouraging the crowds to buy his more reliable locks instead. The lock he sold was the parautoptic lock, designed by Robert Newell and patented by the company Day & Newell. Hobbs gained fame when he managed to pick Bramah's lock and the Chubb detector lock in 1851 at the Crystal Palace Exhibition - locks that had been the best selling and safest locks on the market…up until that point! Hobbs protector lock design was based on the principles of the parautoptic lock - it employed a number of mechanisms that made it impossible to pick. The protector lock was a revolutionary design because it employed several different mechanisms for added security. One of the most important features of the lock is how pressure is applied to the tumbler section via a fixed pin. When it could not be forced to spring open, the pressure was altered by a moveable stump attached to a fixed spring. 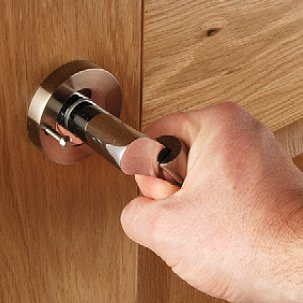 The lock uses an anti pressure device that means that no pressure is applied to the mechanism until all of the leavers are in the correct position and if they are manipulated into the wrong position then the lock resets, meaning that the lock picker would have to start all over again. One of the most common methods of picking a lock at that time was to apply a sticky substance to levers to see where the key was making contact with the lever. The protector lock had an inbuilt wiper that would automatically clean the levers after each use so that the thief could not come back and use a mirror to see where the key had been making contact and apply pressure accordingly. Despite the lock being a complex and innovative design, the patented protector lock was successfully picked by a Chubb employee in 1954. That same year the company Hobbs, Hart & Co became part of the larger Chubb group. The safety mechanisms in the protector lock set a precedent for all future locks - they would have to use more complex methods of safety and design to make picking locks near impossible. There's always an alternative, commonly used lock - the good old reliable padlock! In the ironmongery market there are huge varieties of padlocks available to suit all possible requirements!